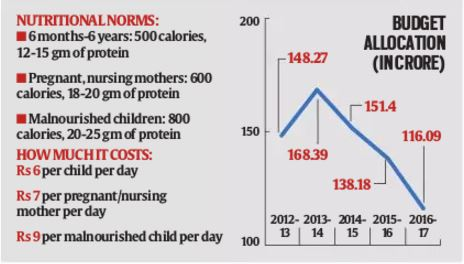 The government has continued to keep malnutrition as its critical focus area and accordingly the outlay for Umbrella ICDS scheme has been increased by almost Rs.4500 crores in the coming financial year as compared to budget allocation of last year. Similarly, the budget of program component of National Nutrition Mission has been increased by Rs.400 crores. Pradhan Mantri Matru Vandana Yojana was launched in October, 2017. The state governments have taken their time to come on board and an end-to-end seamless process of registration - approval - disbursement has been put in place. Accordingly, the allocation under this scheme has been more than doubled from Rs.1200 crores (RE 2018-19) to Rs.2500 crores (BE 2019-20). The Ministry’s focus on protection of children has expanded substantially over the last few years and an ambitious program has been drawn out. The budget under the Integrated Child Protection Services Scheme has been enhanced Rs.925crores to Rs.1500crores. This will enable the ministry to cater to the increased requirements of child protection services from the states which have emerged after effective implementation of the provisions of JJ Act, 2015. This will also provide extra funds for the proposed expansion of Childline.